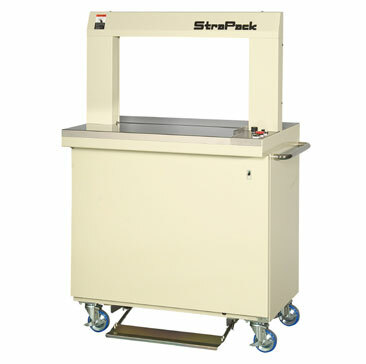 The Strapack RQ-8IR2 and RQ-8IR3 arch strapping machines are designed for the mailing and graphic arts industries, magazine distribution, and newspaper distribution. The internal reel makes these machines ideal for office and clean room applications with space limitations, because the reel being inside the cabinet makes the machine about 12" narrower than external reel models. It also makes these machines very quiet; much quieter than RQ-8 machines with external reels. The RQ-8IR machines are often used to bundle office reports and publications. These machines easily accommodate mail trays through the use of angled sides that are designed to support mail trays. The 16" (400mm) arch height also allows for strapping mail flats. The innovative RQ-8 design makes it the most reliable general-purpose strapping machine on the market. It features easy strap loading, automatic re-feed, automatic loop ejection, lubrication-free operation and safe dual-tension. Dual-tension allows for tension consistency from one package to the next. This makes the RQ-8X ideal for large and small packages alike. The RQ-8IR is extremely reliable, but for the rare occasion when something does go wrong, it has the lowest maintenance and repair costs of any strapping machine available. Reliability, speed, ease of operation, and low maintenance and repair costs make the RQ-8IR series the most cost-effective mail room machine on the market. Call today and ask for a machinery specialist for pricing and availability.